I have always been absolutely in love with the holiday season. Ever since I was a little kid, the “holidays” started a couple of weeks before Thanksgiving and carried right on through New Year’s. Up until I was in college, we had family from Chicago visit for Thanksgiving, so it was always a huge event. Follow that up with all that surrounds Christmas, and I’m in total heaven for about two months of the year. Throw in a few good snowfalls, and it’s sheer utopia around these parts. I was lucky enough to marry someone that shares the same joy in everything and anything Christmas, as well as waking up, peeking outside, and seeing a foot of snow. We love the holidays, and we love having our family around. When we were house hunting, the layout of the main floor was our first priority, wanting a big kitchen and an open floor plan. 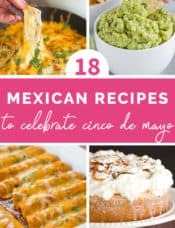 I obviously love spending time in the kitchen, but we had a feeling that we would be doing a lot of entertaining in our home and wanted it to be as conducive to that as possible. We are beyond blessed that our families get along as well as they do. Not only do they love spending time with us, but they love spending time with each other, as well. This makes get-togethers and holidays extremely easy! Driscoll’s Berries is currently celebrating the idea of “Made with Love“; this sentiment is firmly embedded in me, as I come from a long line of people who like to feed others to express their love. I certainly inherited my grandma’s “feeding people is loving people” gene. Even if we’re just hanging out watching a football game, I like to make sure there is something to eat. Around the holidays, I’m especially mindful to have some things on hand that can be turned into an easy appetizer on a moment’s notice. One of my favorite options for years has been a wheel of brie and a jar of fresh apple butter, along with an assortment of crackers. 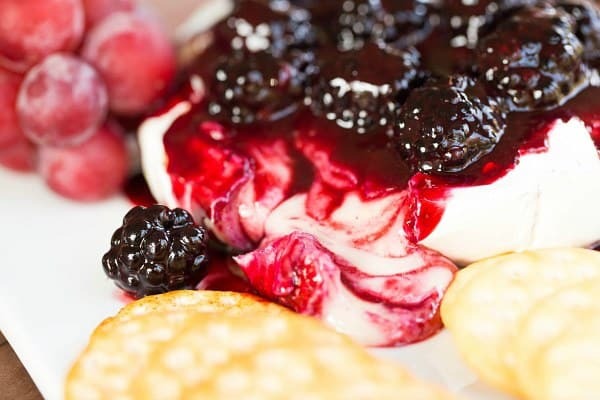 I wanted to put a new twist on my standby brie and thought that fresh berries would be not only delicious, but an unexpected treat in our little corner of the world at this time of year. I cooked down some Driscoll’s blackberries into a wonderful compote and spooned overtop of an oozy-gooey, fresh-from-the-oven wheel of brie. This is a perfect (and super simple) appetizer to throw together when holiday company pops in. 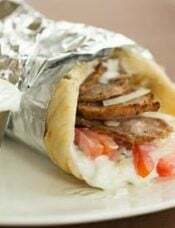 Nothing says love like feeding the people you hold near and dear with some of your favorite food! An easy baked brie recipe topped with fruit compote - a perfect appetizer for holiday parties. Preheat oven to 350 degrees F. Slice the rind off the top of the brie, leaving a ½-inch border along the edges. 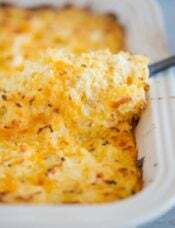 Place on a parchment-lined baking sheet and bake for 12 to 15 minutes, or until the cheese is beginning to melt. Meanwhile, heat the water, sugar and lemon juice over medium heat in a small saucepan. Stir until the sugar dissolves, then allow the mixture to boil until it is reduced to about 2 tablespoons. Pour the syrup into a blender with 1 cup of the blackberries and puree until smooth. Press the puree through a fine-mesh sieve set over a small bowl to remove the seeds. Stir the remaining blackberries into the sauce. 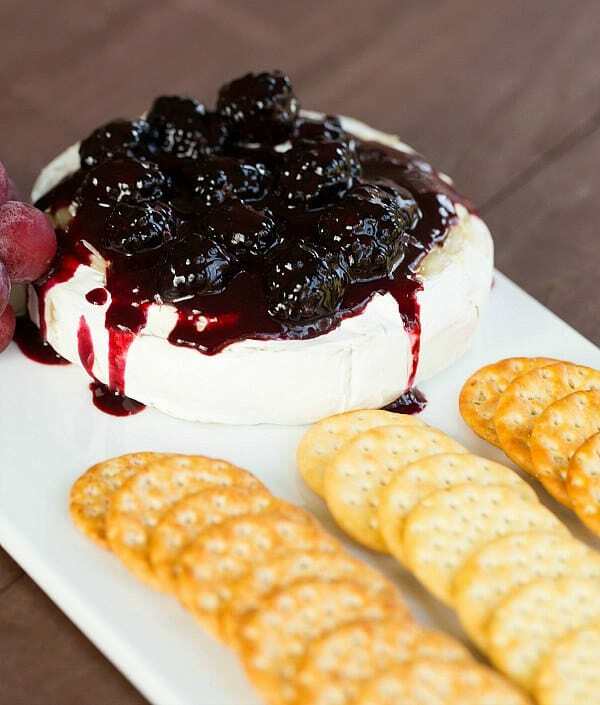 Using a large, flat metal spatula, transfer the brie to a serving platter and top with the blackberry compote. 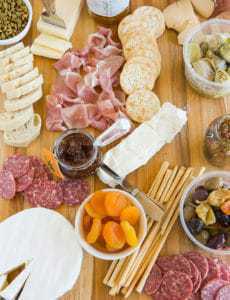 Serve with your favorite crackers or baguette slices. Disclaimer: I have been selected by Dricoll’s Berries to develop a holiday recipe with their berries. While I have been compensated for my time, my opinions are my own, and I have not been paid to post positive comments. Be sure to enter the Made With Love Sweepstakes on the Driscoll’s Berries website; at the end of December, there will be a grand prize winner (KitchenAid Stand Mixer + Berries For a Year!) and two first place winners (Berries For a Year!). Be sure to get your name in before the contest closes on December 31st! This looks so amazing! It would be good with sweet cherries, too, I think. I’ve made baked brie using the log style of brie when I don’t have a huge crowd. I’ll have to try the compote on that next time. I was wondering if you’ve tried canning this compote? If not, how would you recommend storming it so I can make it ahead? Contributing to a friend’s wedding reception and needs to be done ahead of time. Hi Nicole, I would not recommend this recipe for long-term storage via canning. 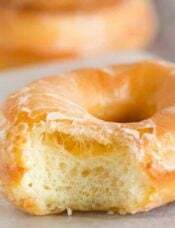 You could freeze it, though, in a freezer-safe container. This is so tempting. I love blackberries – and we grow boysenberries, a type of blackberry, down one of our fences. The only thing I worry about is people dropping/spilling the appetizer. The stain is a killer! How did your carpets and furniture hold up? Thanks for this lovely recipe. I didn’t have any blackberries so used frozen blueberries, and it tasted wonderful. Shall defiantly make again. I’m still not sure what you mean when you say leave a 1/2″border. Hi Sharyn, It means to slice off most of the top of the rind, but to leave ½ inch of rind around the outside border. can you prepare the blackberries ahead of time? Hi Rita, Yes, you could. I love blackberries – and somehow have never thought of this pairing – and so much easier than the brie en croute that I often make and love, but need to plan ahead for… thanks! 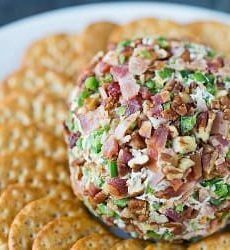 This looks so yummy and a very impressive appetizer, The last time I made a baked brie, I cut off the rind on all sides because I don’t really care for it. What a job that is. I may try this and only cut off the top as she suggests. Oh my….this looks heavenly! I literally took the brie out of my fridge before seeing this to bake it! It’s such a popular treat for this holiday and clearly we know why – it looks amazing and tastes amazing. This looks amazing! 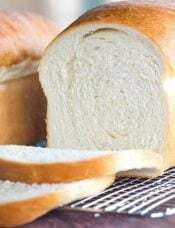 I have a qick question though – do you take off the 1/2″ border around the edges before serving? Or just warn people not to eat it? I have never done anything on my own with Brie (though I can eat it like there’s no tomorrow!) so I am not sure what to do there. Can’t wait to make this for family this season :) Happy holidays! Hi Heather, I usually cut it open just before serving, but I’ve never had anyone try to it (everyone usually just scoops inside the rind. If you think folks wouldn’t be sure, you can trim it off before serving, however it may be pretty soft, so I would use a very sharp serrated knife and a light sawing motion. I am actually serving it tomorrow for my sister, brother in law and 2 year old nephew :) just wanted to make sure my nephew didn’t eat anything he’s not supposed to. Thanks for your help!! The rind is edible, so I wouldn’t worry about it. 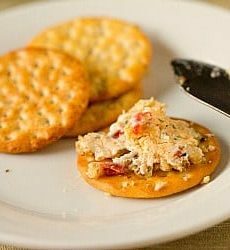 What a perfectly simply appetizer for the holidays! Gorgeous colours too! This is incredible! Brie is such a fabulous cheese! What a gorgeous spread! This looks so awesome and delicious – perfect for a Christmas party. I love that Brie dishes can look so elegant, yet are easy to prepare. 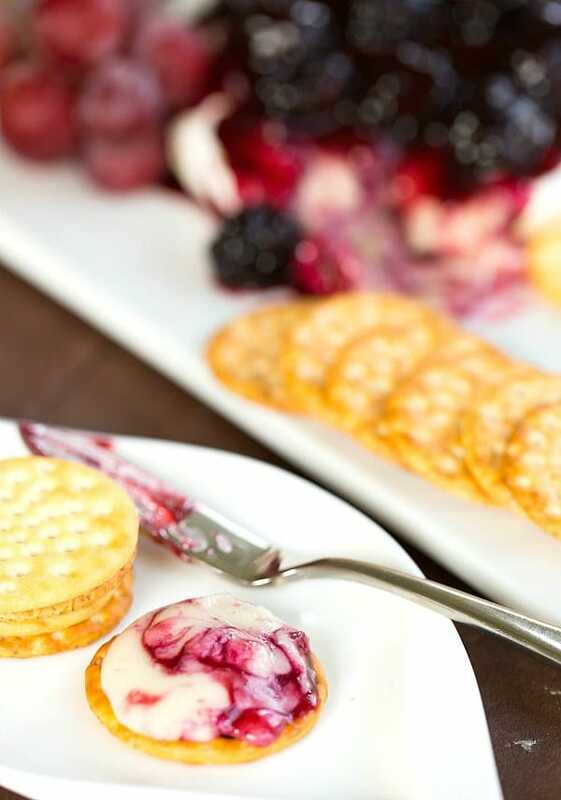 Berries + Brie has to be one of favorite combos. Looks delish! I bet this tastes just wonderful the mixture of brie and blackberries. The colors just pop too. Thanks so much for sharing. This is stunning! 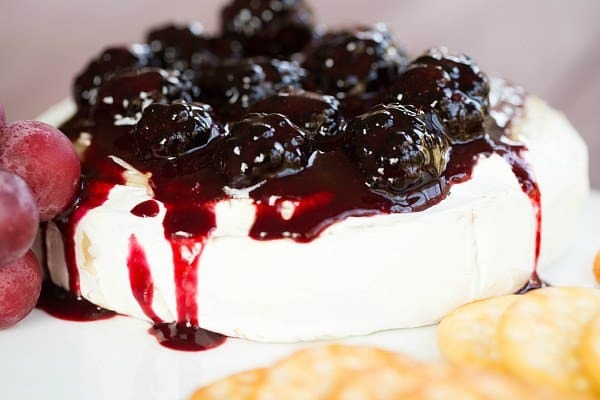 My moms favorite cheese and berry, we will have to make this, thanks! 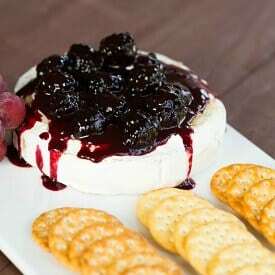 I love baked brie and usually just do homemade hot pepper jelly but love your blackberry compote idea. The color is stunning! For TG, I made a cranberry-blueberry sauce with cabernet and I am really into the chunky fruit sauces and compotes these days. Pinned! 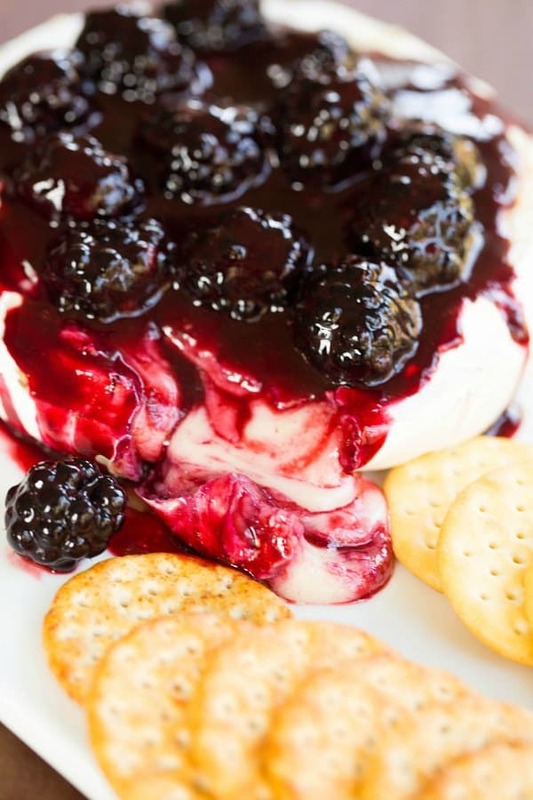 I love baked brie and that blackberry compote is stunning! Is it weird that I want to have this for breakfast? My type of appetizer! 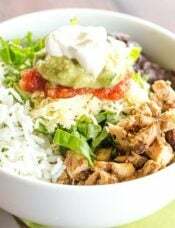 No fuss, visually stunning, and a great combination of flavors.